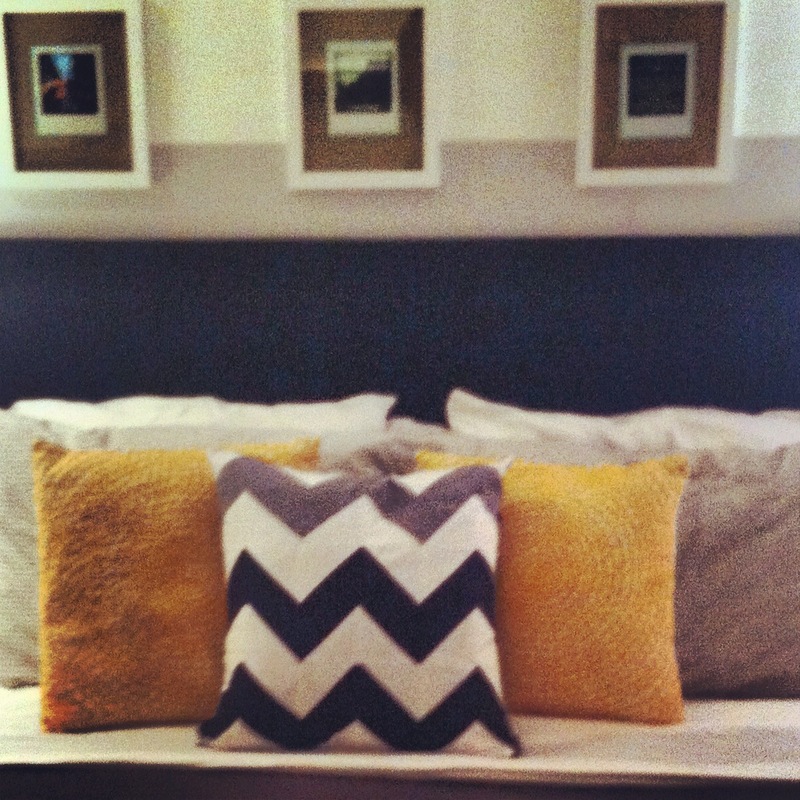 After my sewing debacle earlier this week, I decided it was time to repair and finish the Chevron Stripe pillow. Boy am I glad I did, I love this bad boy. As I mentioned on Monday, the original back to this pillow was supposed to be black, white and grey striped but as you can see in the picture above, I failed to calculate and measure properly and ended up with a back that was 2 inches too short. Of course, I figured this out after I had already sewn in the invisible zipper. I knew I didn’t want to go back and have to start over, so I decided to repair it with a quick and easy fix. 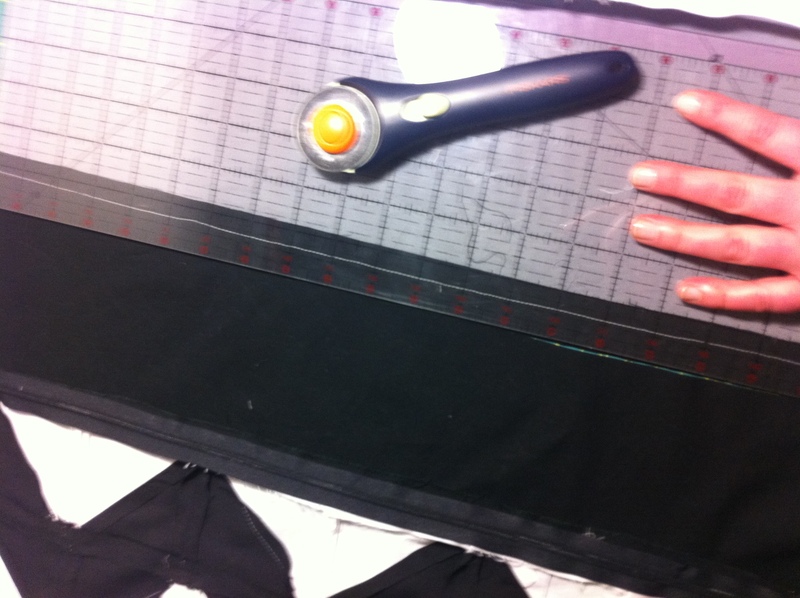 I simply measured the black section of the first back and cut it four inches from the zipper. 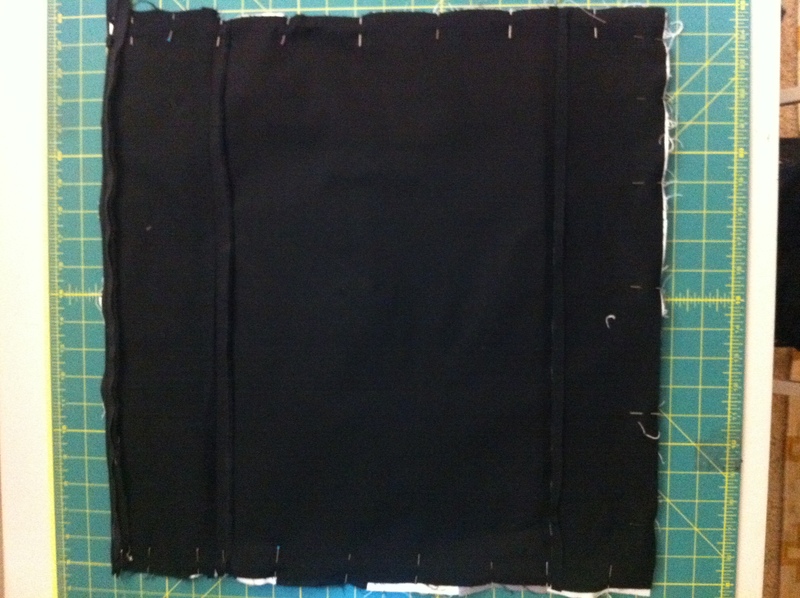 I then cut another piece of black fabric 4 x 20 to be the bookend on other side. Then I measured and cut the center panel so that it was 13 x 20. This gave me 1/4 inch seam allotments to sew the center panel to the left and the right to the center resulting in a 20 x 20 back. If you measure correctly the first time, you won’t need to do this. I recommend that you simply cut a 20 x 20 piece to start with and skip this whole headache. But if you do happen to screw up like I did, realize for the most part there are ways to save a project. If done properly, pillow covers are a cinch to make. Start with two matching sizes panels, my pillow form was 20×20 so that’s the size of the panels I used. Sew the invisible zipper along one of the sides. For more on how to do this, see this post here. Then once the zipper is in, pin the panels right sides together along the remaining three raw edges. Make sure that your zipper is open at this point. 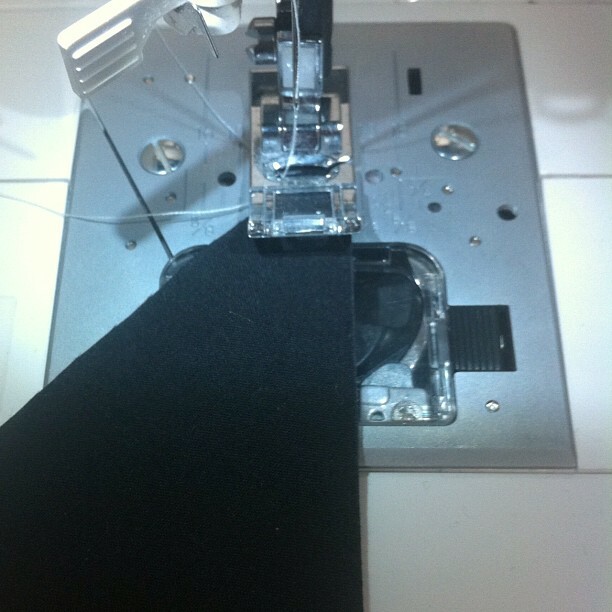 Sew using a 1/4 seam allotment. 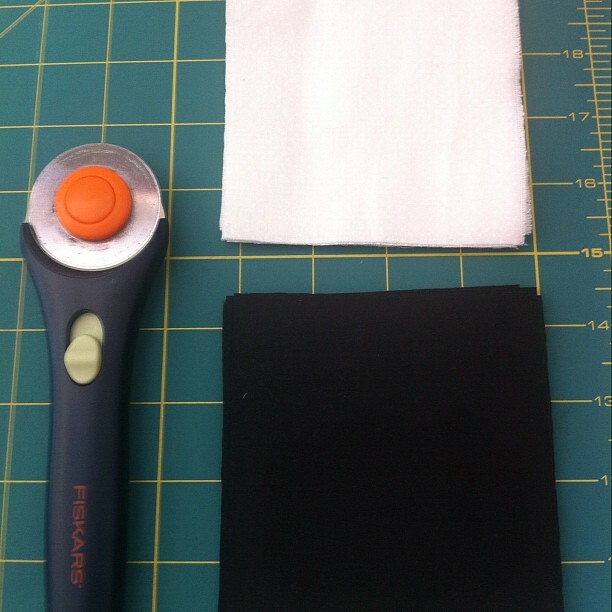 Trim the excess fabric and turn the pillow right side out. Insert form and there you go. Houston, we have a pillow. 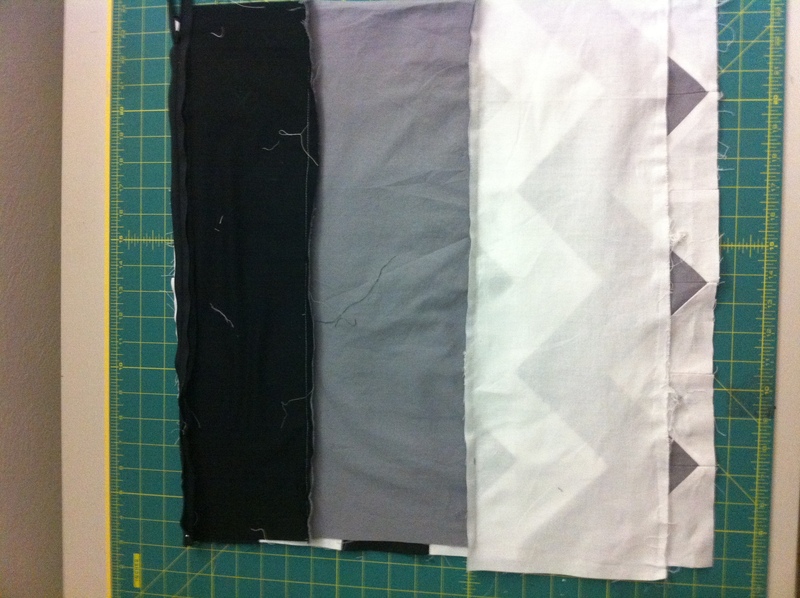 To learn how to make your own chevron stripe fabric, check out our tutorials here and here. Let us know if you make these, we’d love to see your new pillows. Enjoy the weekend! 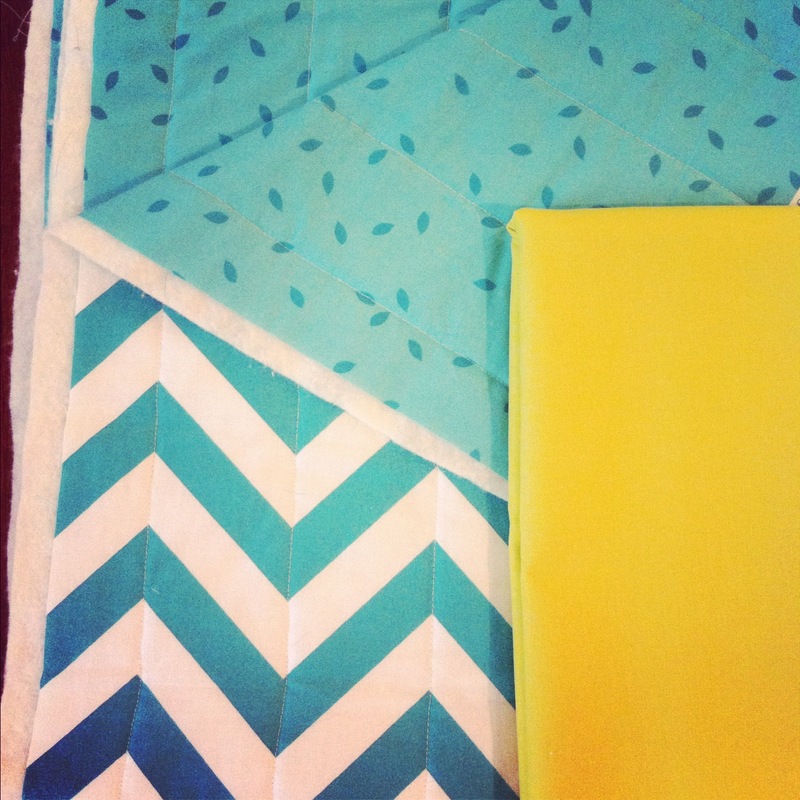 Now that you know how to create the squares for your chevron fabric (thanks Katie!) 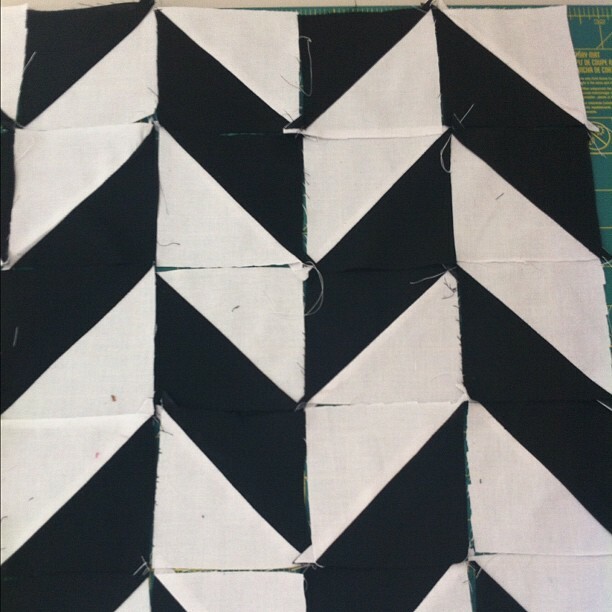 I’m now going to show you how to assemble your fabric into a chevron pattern with a quilt that I’m currently working on. Step one, figure out how many squares will be in one row and then place the squares in two piles (indicated below). 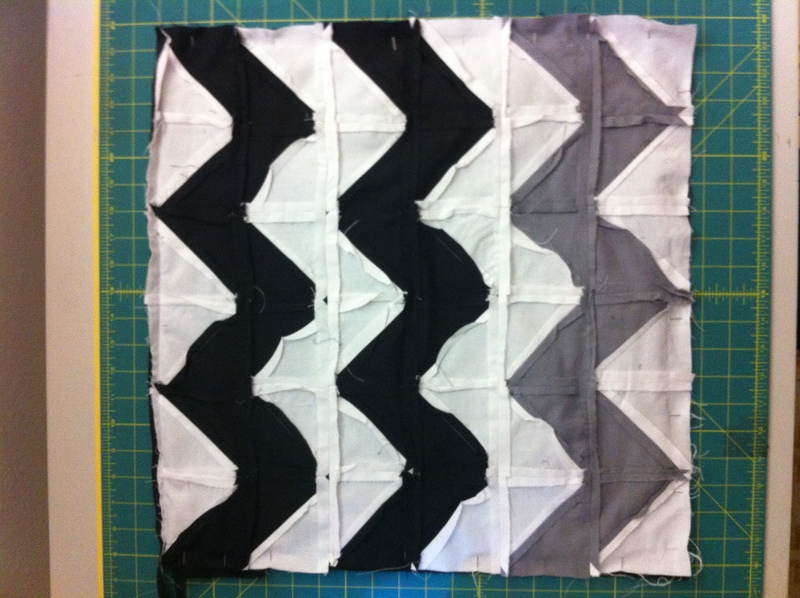 My Chevron quilt consists of one row of ten squares = 5 squares in two piles. 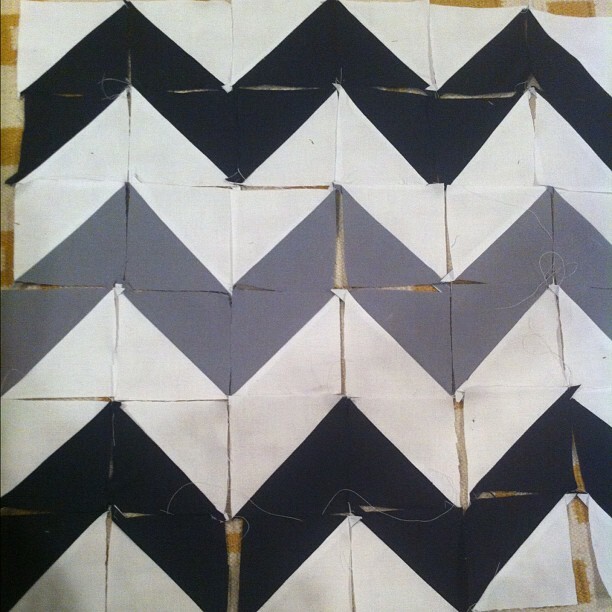 Step two: Place the squares in a row, creating the top half of the chevron pattern. Then stack the squares on top of each other, starting to the left. I’ve found this is a great way to keep your squares in order when sewing them together. 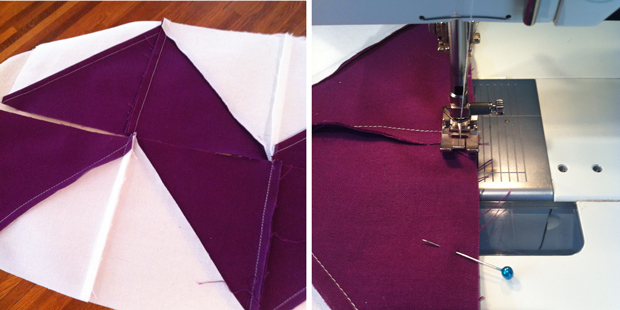 Step 3: Take the top two squares, place right sides together and sew with 1/4in seam. 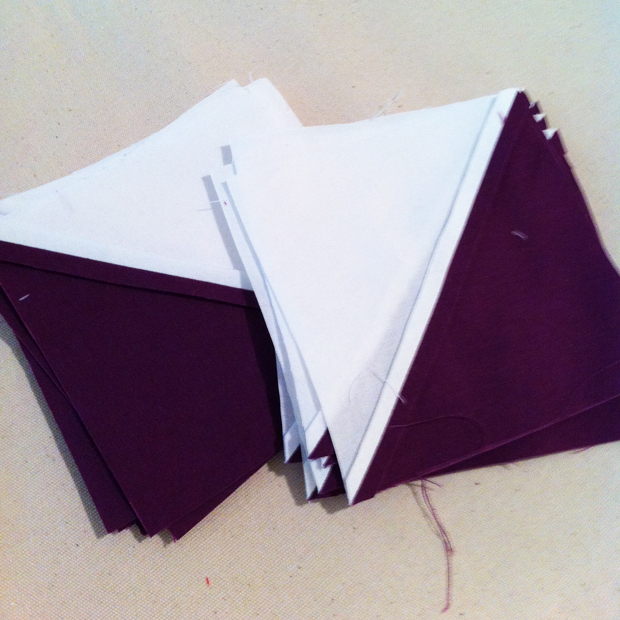 Then take square 3 and place it right side together with square #2 and sew with 1/4in seam. Continue down the line accordingly until your stack is complete. Step 4: Place your completed row right side down and begin to assemble the second row underneath row one. Once row two is complete, repeat steps 1-3. 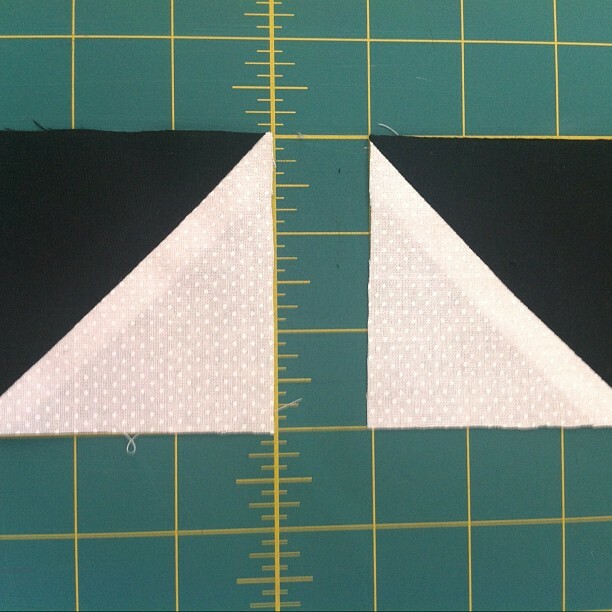 Step 5: Place row one and row two right side down (to double check that the chevron pattern is correct) and then pin the rows right side together and sew with 1/4in seam. I don’t know about you but I am obsessed with stripes lately, specifically chevron stripes. 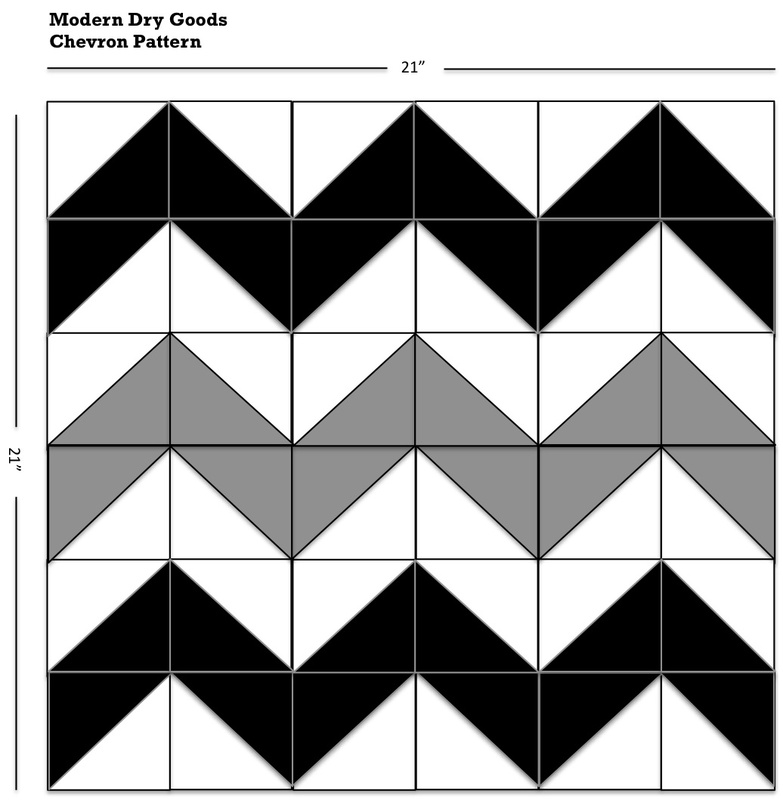 A few months ago, Kristi and I were talking about this chevrons and I mentioned how frustrated I was that I couldn’t find any chevron striped fabric in my local fabric store. At the time, I was ambitiously hoping to sew my own bed skirt (it didn’t happen) but she wisely pointed out that I could easily make my own chevron striped fabric using a basic quilting technique. This is why it’s so great to have someone to share your obsessions with, a healthy dose of perspective and plethora of ideas. This week we are going to do an entire series on the Chevron stripe. Today, I’ll start by showing you the basics of how to build your own striped fabric and then throughout the week we will show you different ways that you can apply this in your next sewing project. So let’s get to it! I know I want this to be 6 squares wide and 6 squares high. 21 divided by 6 is 3.5 and I want to give myself 1/4 inch on either side for the seam allotments, which means that I need my bi-colored squares to be 4″ x 4″. I can also determine by looking at my pattern, that I will need a total of 36 squares, 24 black and white and 12 grey and white. Which means that I will need to cut 18 squares of white, 12 squares of black and 6 squares of grey. 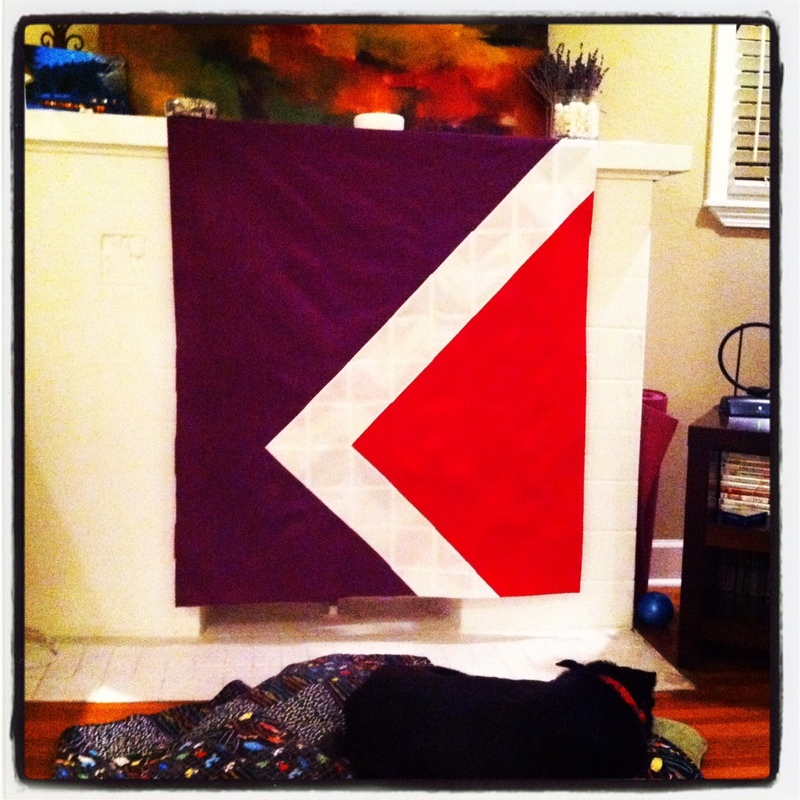 This project is based on a quilting technique where you sew together two equal squares of fabric to create half square triangles. 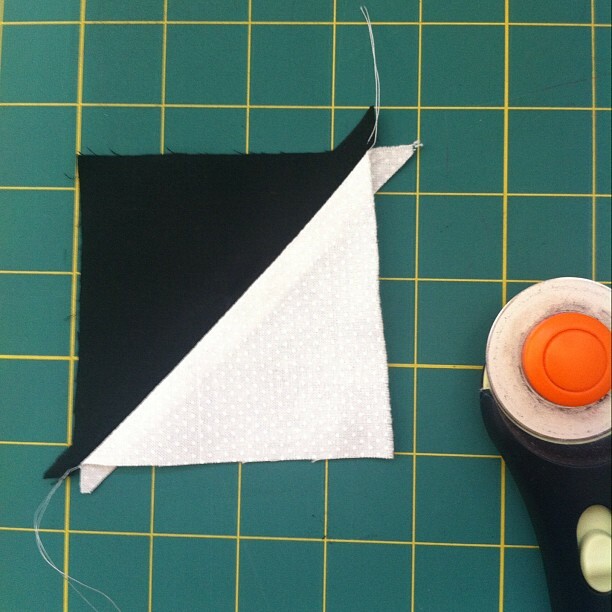 Start by placing the two fabric squares together and using a marking pen, draw a straight line along the diagonal. 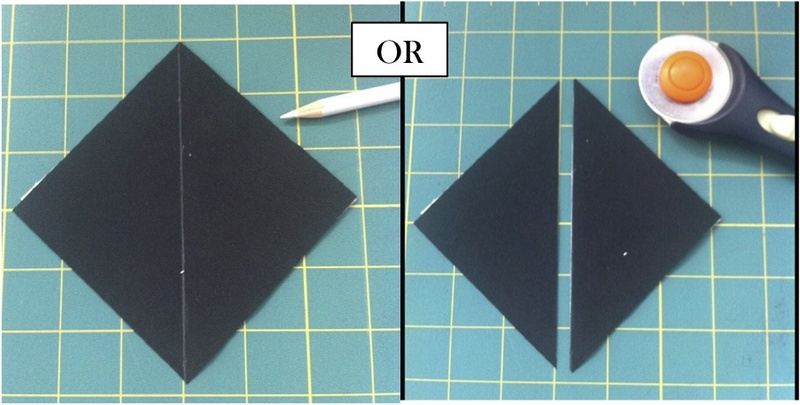 Alternatively, you can just cut the fabric down the diagonal. 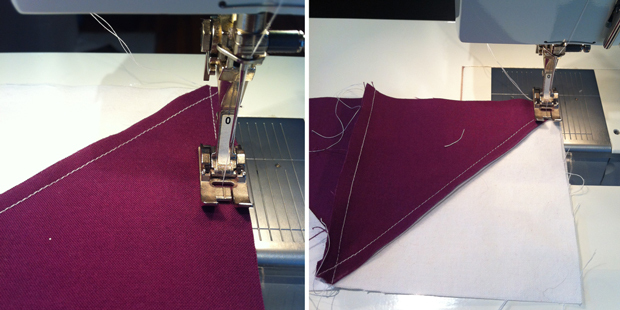 Then, using your sewing machine, with a 1/4 inch seam allotment, sew two lines on either side of the diagonal line. 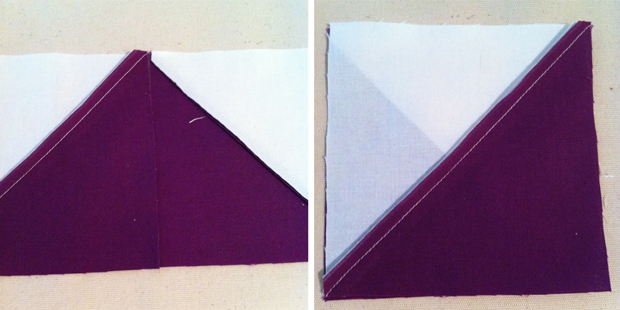 Then, if you haven’t already, separate the into two squares by cutting down the diagonal and then press open the seams. Then, using your ruler and rotary cuter, trim the excesses. Now is also the time to make sure that your squares are even. Isn’t that fun! 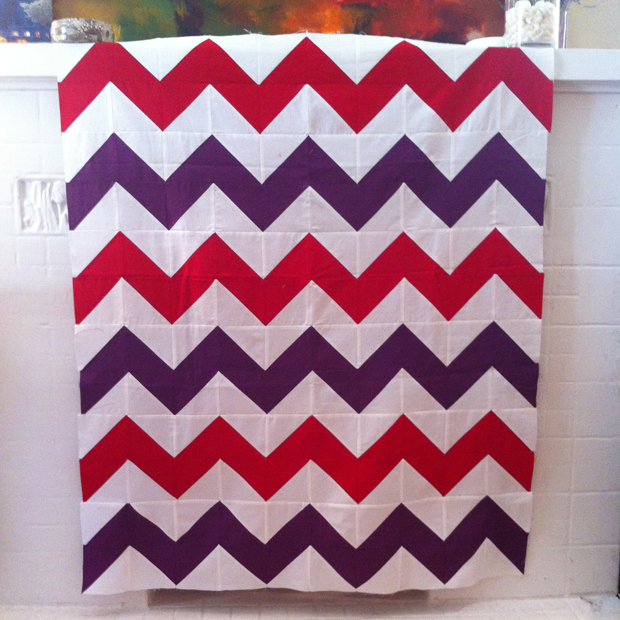 Tomorrow Kristi will show you how to sew the pieces together and will show us her Chevron Quilt she’s been working on. 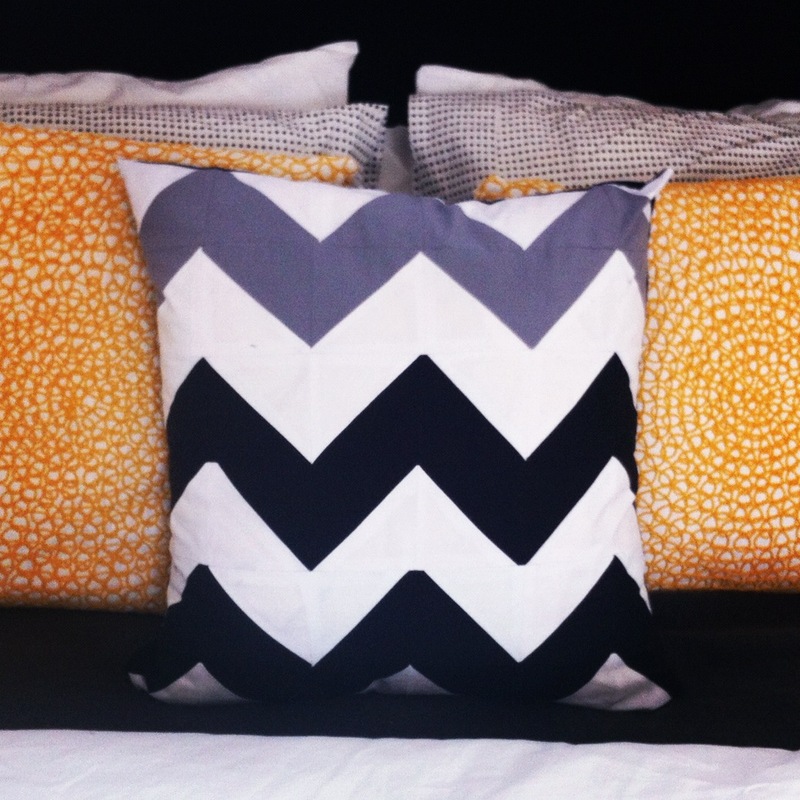 Then on Thursday, I’ll show you how to make a Chevron Striped pillow cover!